Editing applied and unapplied payments. Payments not tied to credit card transactions charged in TheraNest can be edited either as an unapplied payment, or a payment already applied to a client's invoice/service date. 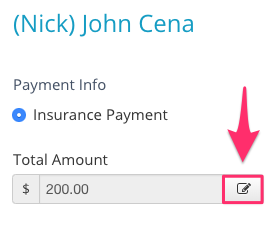 1) Navigate to the client's Ledger page and click the Payment History button at the top right of the page. 2) From the Payment History page, click Details for the payment that needs editing. 3) On the Payment Info page, click the Change amount button to the right of the payment amount to edit the amount of the payment. The payment's Payment Method, Date, Payment Number and Notes can also be edited at this time. If the payment is already applied to an invoice/session, adjust the amount distributed to this session in the Payment field listed below.